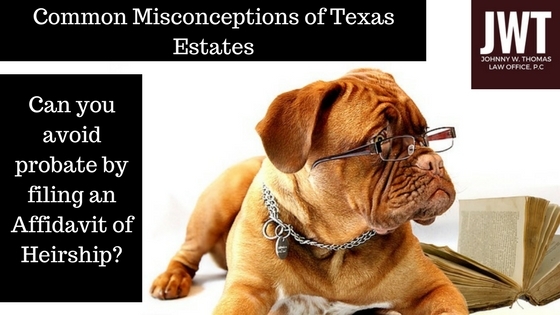 Common Misconceptions: Can you avoid probate in Texas? This is the age of Do-It-Yourself (D-I-Y). More and more people are looking to the Internet to find quick and inexpensive solutions to their probate problems. I understand not wanting to spend money when you can create a solution yourself. However, when it comes to legal solutions, you should never think with the D-I-Y mentality. You can create much bigger problems for the future... problems that will also cost much more to fix. Can I use and Affidavit of Heirship to avoid probate? A common D-I-Y “solution” for probate is an Affidavit of Heirship. A form for this can be easily found on the internet and only requires filing in the county property records. As simple as this seems, an Affidavit of Heirship can serve as a solution in only certain situations and requires knowledge of Texas intestacy succession to draft properly. It would ultimately serve you best to review your deceased loved one’s estate with proper legal counsel to determine what legal action should be taken regarding your loved one’s estate. All roads do not always lead to an expensive probate. An attorney can review your loved one’s property to determine how the estate should be handled. If an attorney determines that an Affidavit of Heirship is the best legal solution for taking care of your loved one’s estate, it would be wise to employ counsel to draft the document. That way you can rest assured the document will be properly drafted and executed. If you are worried about fees, find an attorney that offers services at a flat fee rate. You will be able to pay the attorney one fee and you won’t have to worry about receiving an unexpected bill, later down the road.